Indiana is known for its miles and miles of farmland, which were originally managed by families. In recent years, large corporations have bought many of these farms, where corn and soybeans are grown. Not all the corn is for eating though. Some of it feeds livestock, but much of it is grown to produce ethanol, a non-fossil fuel energy source. 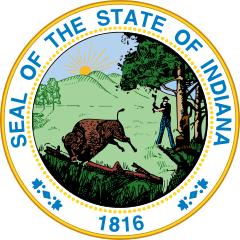 Indiana’s name means “Land of the Indians.” American Indians have lived here for more than 10,000 years. The Miami, Shawnee, and Potawatomi Nations still live here today. The Hopewell, a mysterious native people, buried artifacts in mounds of soil around 2,000 years ago. At Angel Mounds lies 11 mounds, used for burial and ceremonies from 1000 to 1450. French fur traders established the colony of Vincennes in the early 1700s. By the early 1800s, most of the Native Americans had been forced out of the area. 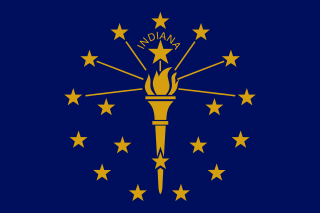 Indiana’s motto is “The Crossroads of America,” and several major freeways intersect in Indianapolis. Indianapolis is also home to the Indy 500, a famous race course since 1911. Basketball is hugely popular in Indiana. Peru, Indiana is home to the International Circus Hall of Fame. Every July, the town hosts Circus Festival. Local children put on a three-ring circus for enthusiastic crowds. Indiana Dunes National Lakeshore is loved for its sand dunes and water. Popcorn maker Orville Redenbacher was born in Indiana. Question: Is popcorn made from regular corn? Answer: Popcorn comes from a special type of corn seed that has a tough outer shell. Farmers in Indiana grow sweet corn—the kind we eat fresh or frozen; dent corn—used for feeding livestock, making corn syrup, and producing ethanol; flour corn—used for making cornmeal; and popcorn. Flint corn, or Indian corn, is often used for fall decorating. Watch a video about Indiana. Declan, Tobin. " Fun Facts for Kids about Indiana ." Easy Science for Kids, Apr 2019. Web. 25 Apr 2019. < https://easyscienceforkids.com/indiana/ >.